In the world of film criticism, the word perfect is tossed around a lot, but honestly, what defines a perfect film? How can one truly gauge something like perfection? To be clear, I am just as guilty of invoking the word as anyone else, mostly to illustrate that an aspect or an entire work felt perfect to me personally. Even then though, how can I be so sure? The Tree of Life is a cinematic experience that is so sublime, so richly rewarding for my soul that I could never actually find a flaw, but does that mean one doesn't exist? Isn't it always possible something technically could be improved upon, even if we aren't able to spot the imperfection no matter how close we look? 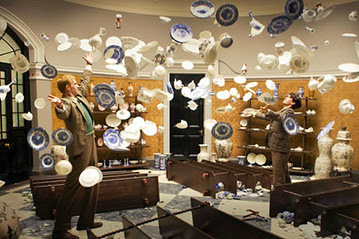 Cloud Atlas isn't a perfect film, not even for me on a personal level. I find the flaws to be minor, but they expose themselves nonetheless. Six stories that take place at vastly different times are weaved together to form a cohesive narrative, and some of these characters and their personal journeys are more interesting and impressive than others, yet as a whole work this is a film that resides inside my top 30 of all time and climbs slowly higher and higher with each revisit. I tend to believe the reason I formed this deep, important connection to Cloud Atlas boils down to a matter of personal preference more than anything else. Some may admire a more minimalist feature that expertly knows its limitations and embraces them, and that is totally fine and understandable. For me though, if you really want to get my film loving juices flowing, sit me down in front of a work that is willing to make a few mistakes in pursuit of grand, massive ambitions. The scope of Cloud Atlas is on a level I have never witnessed before in cinema, a film that aspires for true greatness and for some I am sure it falls short. Not me though. I passionately connected to not only the concept and thematic messages of the film, but also the fact that it soars to seemingly unreachable heights on a technical level. When I read the novel of the same name that this film is adapted from, I understood why it was considered by many to be a work that simply could not be translated to the screen. I found the novel by author David Mitchell to be a literary masterpiece, a challenging read that will reward the persistence of those who are willing to commit to its innovative format in the end, but I sensed that an attempt by the Wachowskis and Tom Tykwer would end up being a rather unfortunate failure. I was wrong, so very very wrong, and I discovered this in an IMAX theater on opening weekend when the fastest cinematic three hours of my life floored me and left me wanting to go back and do it again and again. This being my fourth viewing overall of the film, I still can't wrap my mind around what an achievement the editing of Cloud Atlas is. The novel separated the six different stories which allowed me to mentally focus on only the one in front of me, only the words I was currently reading, and then I would put the book down to take a minute and piece together the thematic and literal connections that linked one story to the next. The reason it felt nearly impossible for the source material to be coherently adapted was essentially, how do you present such material to those that are not familiar with the stories in advance? If you keep the format the same and focus on one set of characters at a time, you risk losing the audience during the segments that are deemed less compelling, but to attempt to weave through the past, the present and the future all at once seemed destined to befuddle an audience that entered the cinema with no prior knowledge, unprepared for what awaits them. I am in awe of how seamlessly the film is pieced together, as I find from beginning to end it takes on an almost lyrical flow that overwhelms me with joy. If someone were to ask me for a definition of pacing that I find ideal, I would turn to Cloud Atlas and point to the intimidating running time on paper and challenge them to actually feel any sluggish moments, any fat they would trim due to boredom. I have seen films that are literally half the length of this that bore me to tears, forcing me to check the clock on the wall and beg for the hands to move a bit faster. When I watch Cloud Atlas, clocks don't exist. Time is rendered meaningless. All that matters is what is in front of me, a work that defines epic, a work that even at its silliest lows, it is still utterly fascinating. Cloud Atlas certainly isn't perfect, but I'm not sure any film really is. Considering its ambitions and the fact that practically every single second of this wonder had me glued to the screen, I don't search for nor need perfection. I am thankful of anything bold, exciting, and unique that will resonate in my mind and heart for the rest of my life, and without a doubt this is a work that has cemented its spot forever.